If you missed JazzErie's 2012 annual Singers Night, you missed the debut of the Four G's with the Presque Isle Little Big Band. But you can see one of their performances below. Carl Hultman, originator of The Four G’s, says he has always been drawn to Four Freshmen arrangements. “When I first heard them years ago, I loved the blend of their voices, the tight harmonies. When I realized they were accompanying themselves – playing the instrumental parts as well – that was amazing. "I began thinking about starting a four-piece vocal/instrumental group. I needed a horn player who could sing, and found Stan Bialomizy, a wonderful reeds musician who has played with the Benny Goodman, Tommy Dorsey and Glen Miller bands, the Temptations, and many local bands – and, it turns out, taught vocal music in New York for many years. And Stan was interested in the idea! "Bob Seaman, a fine bass player and vocalist who could sing in a high range, and sings in many area groups, came aboard. 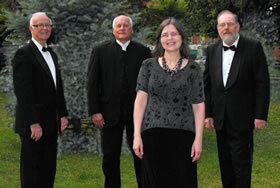 And Barb Schwartz, who has a beautiful true voice, perfect pitch, and plays guitar and banjo – and with whom I’ve worked for many years, completed the quartet." "Since our first get-together, the sound has been great. Stan, who’s a vocal instructor, began to offer suggestions about technique: pronunciation, coordination, choreography. So his role is vocal coach for the group. We want to get the group to a level where we can go anywhere and feel competitive." Tunes the group will sing on Singers Night are “It’s a Blue World,” “Poincianna,” “Graduation Day,” and “And Now It’s Over,” all Four Freshmen arrangements. Carl teaches chemistry at Gannon University, is the resident expert on nanotechnology, and is a partner in a high tech metal plating company. Barb teaches at Girard Middle School, was formerly a research chemist at International Paper. Bob is manager of a State Liquor Store. Stan is a retired music teacher in the New York school system, at both secondary and college levels, as well as a practicing professional musician. Here's Joe Dorris introducing the group, followed by the Four G's performing Graduation Day.